This week I had the good fortune to come across 5 Reasons Your Child Should be Friends With Someone Who Has Special Needs. Everyone should read this article, by the way. It inspired me to share my perspective, too. As the parent of a child with no particular special needs and of twins with physical disabilities, diversity, acceptance and understanding is the only way of life my family knows. 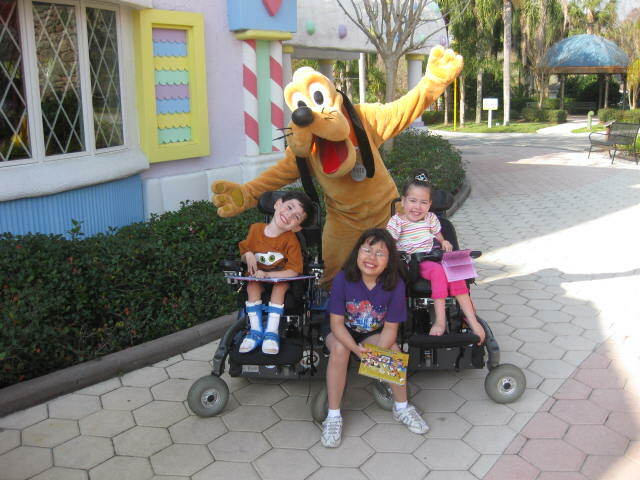 In fact at my house, the kids in wheelchairs are the majority and the kid not in a wheelchair is in the minority. We may have even reached a point where we don’t assimilate into our community–it’s more like our community assimilates into us. (And thanks for that, Community!) But it has occurred to me that in general, most families probably don’t have many opportunities to talk to their children about the “differently abled” or “special needs” kids and adults they may encounter in their lives. I realize that this topic isn’t particularly “twin tuesday”-centric, but humor me. When I was in grade school (waaaay back in the 1980’s–a whole other century ago, even. I’m talking about the days when answering a cordless phone involved pulling out the antennae first, if your family could even afford a cordless phone while they were still paying off their Betamax while you were still navigating the Oregon Trail on the school’s Apple IIe), I remember a stigma associated with special needs kids. They never seemed to fully assimilate with our classmates, and the fact that they were escorted from the classroom by a very quiet therapist/teacher once or twice a day did not help us relate to them. I was shy, wore incredibly thick glasses and was observant. I watched how the other kids treated (or mistreated) the special ed kids when our teacher wasn’t looking. I personally defended them occasionally, but not nearly often enough. I didn’t have many friends and couldn’t afford to lose the ones I had by standing up for a classmate who sometimes had no clue that I was risking my friendships with the only classmates who would sit next to me in the cafeteria at lunch. How ridiculous does that sound now, as an adult? Very. Shameful, even. Yet here I sit, the parent of two brilliant almost-kindergarteners who are wheelchair-bound and about to dive into the public school system, putting them within eye-poking reach of a couple dozen of their peers who likely have not had one-on-one contact with a kid their age in a wheelchair. This is such a critical moment for all the kids: for my kids, who will need to harness all of their people management skills and all of their patience and understanding, and for their peers. And let’s face it, their peers don’t have a lot of responsibility here. When it comes to dealing with a handicapped five year old, my children’s classmates will only know what my children teach them, how their teachers model for them, and what their parents at home reinforce. I can beg, plead, and send personal notes home to their classmates’ parents, but ultimately I have little control how this new microcosm of society treats my kids. I can’t bear to think that either twin could be ignored, dismissed, shunned or left out simply because he and she are in wheelchairs. But I know how kids can be, how Groupthink can work against the kid who doesn’t look like the others. And what is that? That is exactly the wrong thing to say. Now you’ve just taught your child to feel bad about something he legitimately doesn’t know the answer to AND you’ve taught him to be ashamed about asking a logical question AND made my kid realize that he is something not to be addressed with a smile and handshake but with an aversion of eyes while you try to ignore him. Who does this help, exactly? Every single time the above scenario happens I am so glad I am there for my kids. “Well, that dad was strange. Why didn’t he just tell his daughter that this is a wheelchair you’re sitting in and then let her come say hi?” “I don’t know, Mom. Maybe they’re shy. I liked her sparkly shoes.” And now my four-year-old has exhibited more open-minded maturity than the other parent, and I plaster a smile on my face and pass out hugs because they don’t need another negative experience in their lives. There’s nothing wrong with being honest with your kids, and teaching them to be honest and genuine as well. Kids are so innocent and truly mean no harm when I hear them ask: “What is wrong with that boy?” or “Why can’t I have one of those?” If I am ever in a position to answer the child when I hear them ask these questions, I try to keep my answer age-appropriate, but just so you know I am happy to reply: “There’s nothing wrong with him, but his legs are too weak to walk. He drives a wheelchair. It’s blue and it’s fast.” or “Well, lots of people who are like you don’t need a wheelchair. That’s not a toy, it’s just that his legs aren’t strong like yours and so he uses his powerchair to run around.” and “Well, you should ask her. She can explain how her legs aren’t strong enough to walk, but she can run faster than I can by using her joystick. You should ask her to race!” And that’s if my kids will even give me a head start to answer the question–they’ve no hearing issues and are a bit extroverted, so it’s very likely that they will take over the conversation in the best, most age-appropriate way possible. They could teach us volumes. Sometimes my kids ask about our neighbor, a boy a few doors down who has extreme autism. Why doesn’t he answer me? Why won’t he wear shoes? Why doesn’t he talk? Why does he walk into the street when his parents tell him to stop? These are challenging questions for me to answer. The boy appears completely normal from their points of view, but they sense something isn’t completely right. I don’t always have the perfect answer to everything, but this one I feel comfortable with (and this really applies to every single person we come into contact with, at all stages of life): Everyone has problems. Sometimes you can see someone’s problems on the outside, and sometimes they look fine from the outside because their problems are on the inside. My kids have heard it a million times if they’ve heard it once. We all struggle with something. Nobody is entirely perfect inside AND outside. And there’s nothing wrong with questions–from adults, children, store clerks, neighbors, bus drivers. Judging? Assuming? Alienating? Bullying? Projecting? That’s not okay. And unless you want to serve as a very unfortunate example of someone who has “problems on the inside”, you will not make my twins feel bad or allow them to sense any interpersonal negativity based on their physical disabilities. And you will make the world a better place when you teach your own children acceptance and tolerance and inclusion by modeling these values yourself. You know, like Pluto here. As the children’s summer break from school hurls towards my face and the first of the warm-weather holidays that is Mother’s Day is upon us, let’s take a moment and listen to the parenting I shall impart upon you. Ha. As if. I got nothin’. I still don’t even know what I’m doing. My oldest is eight. Eight years old. That means I can serve as an expert witness on a short number of topics, ranging from the pros and cons of Greg Wiggle versus Sam Wiggle (Mom verdict: Anthony Wiggle wins it all) to how to handle the appeal of incidental sidewalk chalk on a small child and what to do if unsuccessful at redirecting her attention to something which you don’t hate cleaning from her hands. So as we soonly approach this Mother’s Day, I feel like as an experienced parent of barrels and barrels of children (totaling three children) I am obligated to share some expert parenting advice. For free. Relax, retained attorneys! The advice is good. Stand down. Tip #2: Give them every Band-Aid they ask for. My kids claim to require Band-Aids for any bump, thump, scrape, scrap. And this happens daily. I mean, come ON! My lower right patella has a bruise the size of their heads right now yet I carry on like nothing ever happened (what even happened? I’ve no idea). But you know what? Kids like to be tended to, to be taken seriously, to think they are Kind of a Big Deal. Guess what? A box of Band-Aids costs $1.50 (ish). That’s a month’s worth of battles you don’t have to fight so that your kids can feel triumphant and you get to be the hero. Plaster those Barbie/Mickey Mouse/sheer yet not quite flesh colored bandages all over their everywheres. Because you know what? We moms know that this Mother’s Day holiday is manufactured by the greeting card companies (is it though?!). But we know we deserve it because if our own moms deserve us fawning over them one day a year, we deserve our kids stressing out a little about if their butterfly/handprint decoupage pencil holder is as good as the other kids’. This was week three of Avery’s Bucket List: a bittersweet chronicle of an SMA baby and her life experiences, which her parents packed in as quickly as possible. Her story went viral, and fast. Avery was diagnosed with Spinal Muscular Atrophy last month at 5 months old. They started her blog a few days later, and had 30,000 hits within three days. Her family was given the realistic prognosis that she may only be with us another eighteen months, possibly less (at least 50% of SMA type 1’s pass away before their second birthday). But rather than grieve privately or otherwise withdraw, they decided to celebrate Avery’s life while she’s here, give her the fullest life possible, and use social media to share their reality and raise awareness of SMA. Her parents started a blog and listed all the fun events and milestones they wanted for their child. They called it her bucket list–a charming yet pretty horrible concept for most of us to consider. Word spread, and fast! Crossed off of her bucket list: throwing out the first pitch, being kissed by a boy, going to a water park, flying a kite. The blog really caught on. Subscribers checked each day to see photos of what new fun things Avery could check off her bucket list. CNN and ABC ran stories on her. Avery and her family had little time left together, but they did their damnedest to raise an incredible amount of awareness–and money for research–in an extremely short period of time. Their blog hits crested a million. Then two million. Avery passed away last Monday, April 30 2012. After a healthy weekend and no hint of what was to come, her lung collapsed at home and she died at the hospital a few hours later. It happens. That fast. I wish I could say that I can’t imagine how her parents are dealing with this, but I can. I haven’t had to, yet, but SMA parents are constantly preparing themselves for the worst. Avery isn’t the first. Avery isn’t the last. Avery’s parents knew this, and found the courage and time to let us peek into her life in ways which resonated with everyone–especially among people who didn’t know what SMA is. And those folks didn’t leave Avery’s blog and shut down their computers–they donated money. Less than 48 hours after Avery’s passing saw a jaw-dropping $130,000 USD in donations targeted for an incredibly promising gene therapy clinical trial. The SMA community is buzzing with excitement about this. I am optimistic, but my heart remains heavy. This trial will target the youngest SMA patients, and as this trial has not yet begun, it’s likely that the babies who will eventually be part of this trial aren’t even born yet. Today, they rest comfortably in their mothers’ wombs and their families have no idea how they are about to be tested. Use the links above to learn more about Avery and about SMA. Keep Avery’s last bucket list wish alive (to spread awareness of SMA) by sharing this post. It’s that time of year again… National Mom’s Nite Out! 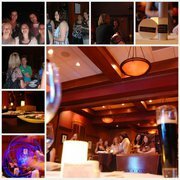 National Mom’s Nite Out is a multi-city event on May 10th. I’m so pleased to announce that The Capital Grille in Scottsdale is hosting us again this year. They hosted us in 2010 and it was such an amazing experience! Come join us for food, drink, prizes and wonderful take home gift bags! Feel free to pass on the invite to a friend. Tickets are available until our limit is reached… so act quickly and get your ticket now! A big thanks to our friend Kate… who will be the official event photographer and to Sara and Jess for helping me to promote the event. And of course… our greatest thanks goes out to Maria Bailey, who founded this event. Thank you for reminding us that time in celebration with our friends is a worthwhile and much needed thing!